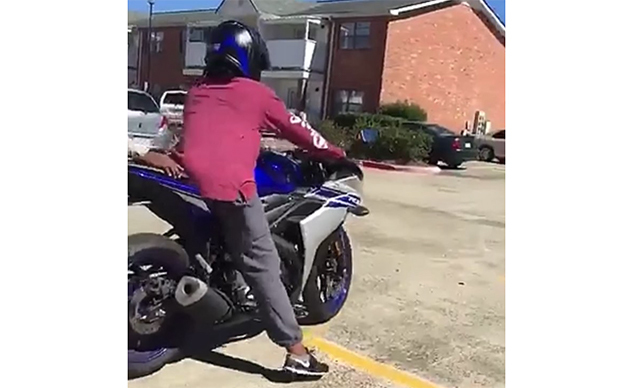 You’ve got a brand new Yamaha R3, and you want to share the excitement by teaching your significant other how to ride too. It’s a small lightweight bike that’s easy to handle, the parking lot is flat and safe – what could go wrong? The bike will be okay ?? Uh-oh. Now you’ve got, as the English race announcers love to say, a “decidedly second-hand” R3 and an SO who’s not only angry and bruised but also missing a shoe. Where the hell did that land anyway? We’re making progress, though, by wearing a helmet, and even gloves! Things could’ve been much worse. Signing up for a motorcycle safety course is the way to go: Ride somebody else’s bike in a big empty lot. Signing up for a professional course would’ve cost much less than fixing that poor little R3.